Simple hot pot dish with donabe is something I do so often at home especially in the winter time. 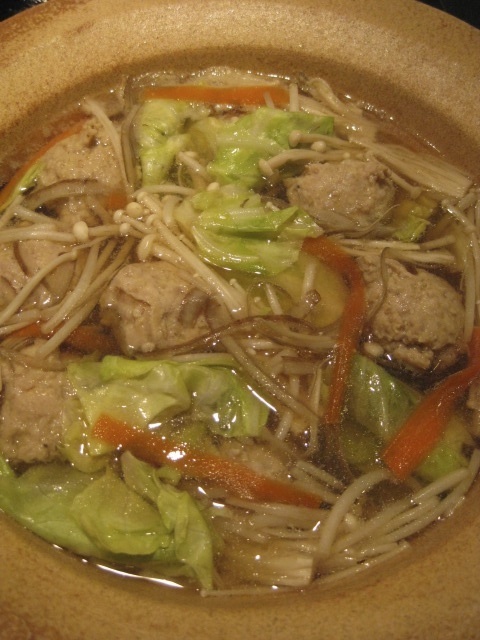 This dish is just about chicken meat balls ("tsukune") and cabbage. Then, I normally just add whatever I already have or feel like eating. Get the ingredients ready and let's make it. 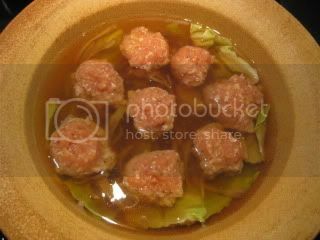 *In order to prevent the broth from getting cloudy, as soon as the burdock is sliced, soak it in cold water for a few minutes and drain. 1. 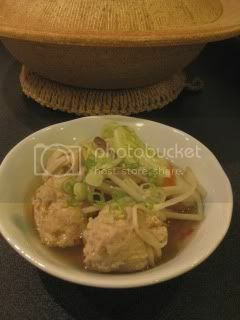 In a bowl, combine the ingredients for the chicken meat balls and mix by hand until the texture is smooth. Cover and refrigerate for 30 minutes. 2. Meanwhile, in donabe, combine the chicken stock, sake, mirin, and light-color soy sauce. Bring to simmer over medium-heat. 3. 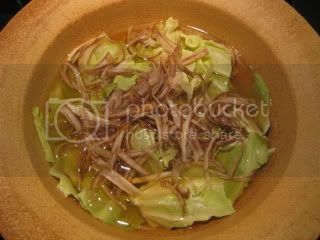 Add the cabbage and burdock root slices. 4. By using 2 spoons, make a ping pong size ball with the chicken mixture and add to the broth. Quickly continue the process with the remaining chicken mixture. 5. Cover and simmer for 3-4 minutes. 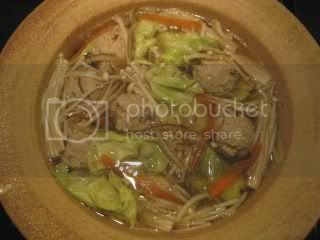 Reduce the heat if the broth starts boiling. 6. 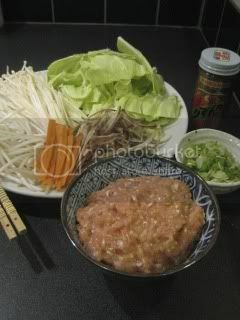 Add the bean sprouts, carrot, and enoki mushrooms. Cover again and simmer for a few more minutes or until everything is cooked through. 7. Remove from heat. Serve into individual bowls and garnish with scallion and shichimi pepper. 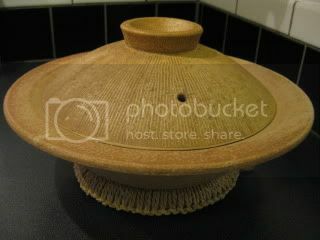 This is special extra-aged "Kanzuri", called "Nama Kanzuri". 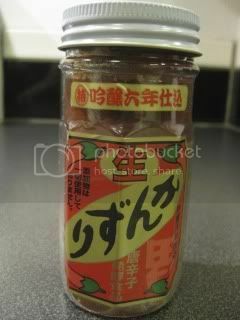 Kanzuri is a type of condiment from Niigata, Japan. It's made of hot chili which were salt-marinated for several months then rest on the snow for 3-4 days in the wintertime, and fermented with yuzu rind, koji, and salt. This special "Nama Kanzuri" is aged for 6 years and only 100 bottles are released every month. The flavor is so deep and complex with the similar fermented nuance as ginjo sake. This condiment goes so well with the "tsukune" meat balls.